For some children, the task of writing a poem is daunting. Introducing those kids to more concrete poetry scaffolds them and provides them with a framework that gets them started. If you’re looking for a tool that encourages poetry writing, check out ReadWriteThink’s Theme Poems. 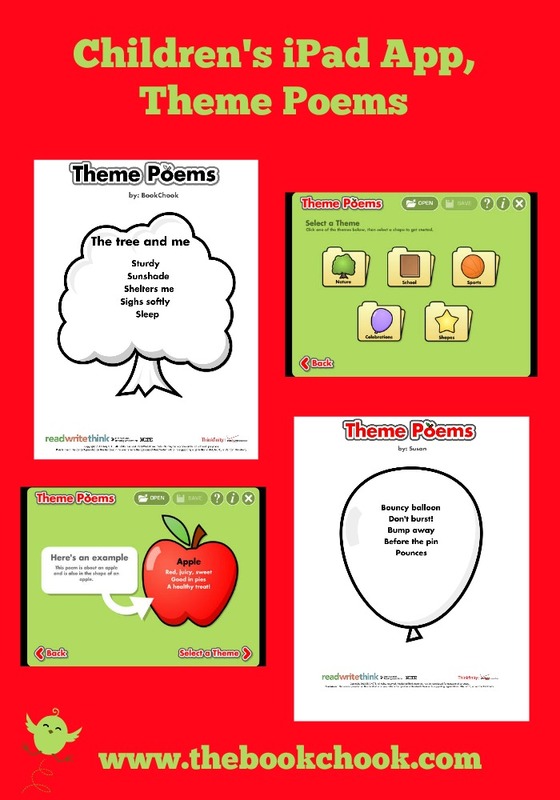 Theme Poems is an interactive online tool, an iPad app and an Android app. The ReadWriteThink website not only has the tool (Flash Player required) but also has grade appropriate lessons to support it. This app allows users to learn about and write theme poems. A theme poem is a poem written within the shape of subject of the poem, such as writing about a birthday cake in the shape of a cake. This educational tool allows users to save their work-in-progress to revise and edit, reinforcing elements of the writing process. Users can send their finished poem to the camera roll or email a .pdf file to friends and family. Created with classroom use in mind, this tool allows users to create their own profile to store their work, making device sharing easier for students. I downloaded the app to my iPad. First of all, I needed to set up a very brief profile: a name and my choice of an avatar. I liked that idea. It’s a nice incidental way to discuss privacy with kids, and choosing an avatar is fun, and a way for children to ease into what may be a daunting task. Next, after a very brief explanation of theme poems, kids are encouraged to select a shape from themes like school, nature, and sports, then to think of words and phrases “that remind you of this shape”. With a list of words brainstormed, it’s time to craft the words into a poem. Editing is easy and the final result can be saved as a JPEG file to the camera roll. The website tool works similarly, but doesn’t have the avatar. It does however let kids save to their computers as a PDF. I like lots of things about this app. First of all, it’s free. It doesn’t have too many distracting bells and whistles but it’s colourful and simple to use. It doesn’t take long for users to create a poem similar to the example the app gives. I absolutely love the idea of children being able to create with words of their own, and realising they too can become poets! I have also previously reviewed ReadWriteThink's Trading Card and Word Mover. I’ll be adding Theme Poems to Creating with Kids and iPad Apps that I updated in January. Check out my iPad App Reviews on Pinterest, and find more apps and articles via my Listly page.